Another tag today using the new Holly Bough Stencil...I mean I couldn't stop at only one. This time I'm using a #8 tag. Color the tag with Festive Berries Distress Stain by adding the stain to a craft mat then spritzing some water onto the stain. Lay the tag into the mix for the initial coating. Then dry with a heat tool, going back into the stain numerous times to build up the layers of red. 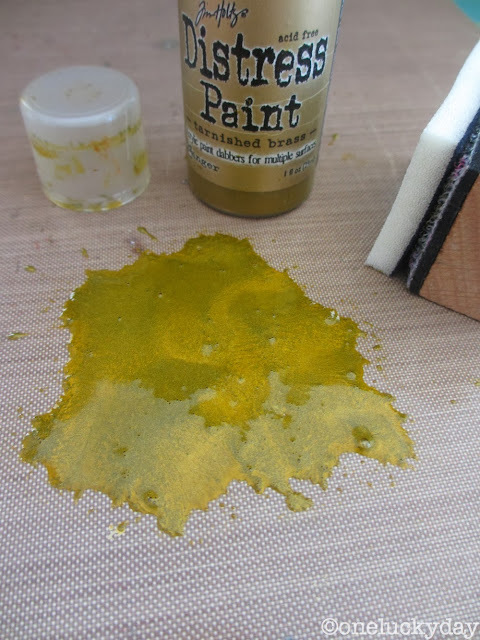 Pounce a little Distress Paint in Tarnished Brass onto the craft sheet. 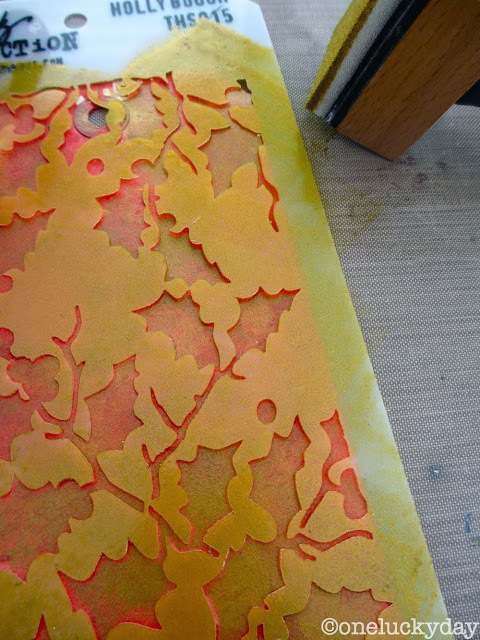 Using the Blending tool and a foam pad, add the paint over the Holly Bough Stencil pattern. Work quickly and wash the stencil immediately. Lift stencil to reveal the golden holly...a very subtle glow. A sentiment from the Deco Christmas set works great since it runs down the side of the tag leaving room to add more embellishment. 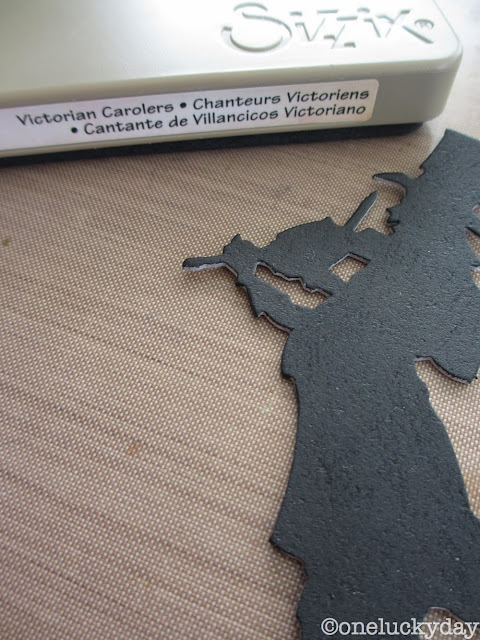 I painted a piece of Grungeboard in black, then used the Vagabond to cut the Victorian Carolers die. The die has a man and lady but I'm just using the man playing the violin today. Add him to the tag. Then a Seasonal Word band tied with red and cream Trimmings. I added a small pieces of Wonder tape (1/8" wide) to his hat. 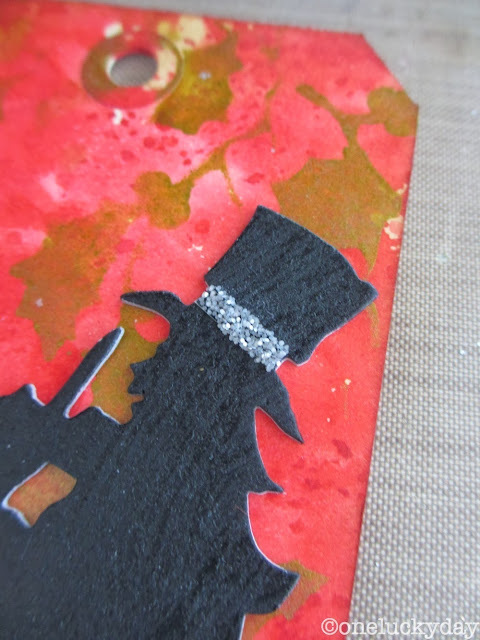 Then sprinkled a very small amount of Distress Glitter over the Wonder Tape. I pressed it into the tape then dusted off the excess. 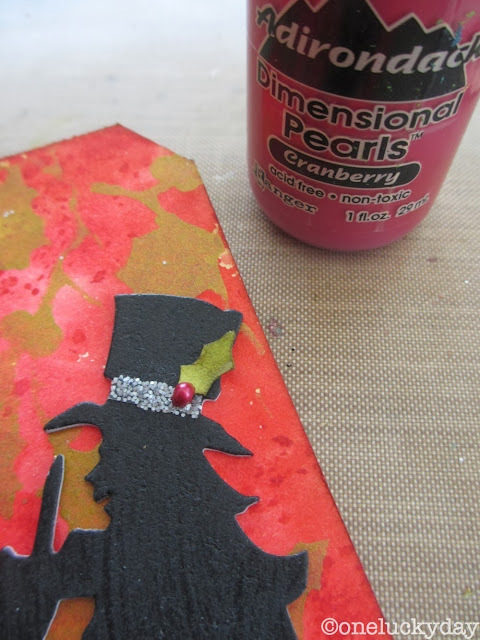 Hand cut a piece of holly then add a dot of Cranberry Dimensional Pearls for the berry. Once dry, I added music from the Christmas Remnant Rubs. Each package comes with a sheet of black and a sheet of white. The white is perfect over the black paint surface. A little Distress ink to knock back the white color just a bit, and we're done. Well, it's back to working on cutting, mailing, planning, creating, gathering and garage sale shopping (all code for top secret CHA stuff). Can't wait for the reveal in just a few short weeks. I mean who knows what I will find on the side of the road this year? Thank you, Paula, for another idea of how to use my newly won holly stencil! Keep 'em comin'! Happy Thanksgiving to you and yours! We must have been channeling each other this morning! I did one using Wendy's gold embossing paste and Distress Ink pads. Fixing to post pics now. Love yours with the caroler man! You have the perfect touch with everything you create Paula! Love it! Just love this Paula. Happy Thanksgiving! WOW This is great, i loved tags a lot. Genius. I'm loving hte holly stencil....such a cool background! Definitely carry on - I can't wait to see the new CHA release and hopefully a few more Christmas projects on your blog this year??? 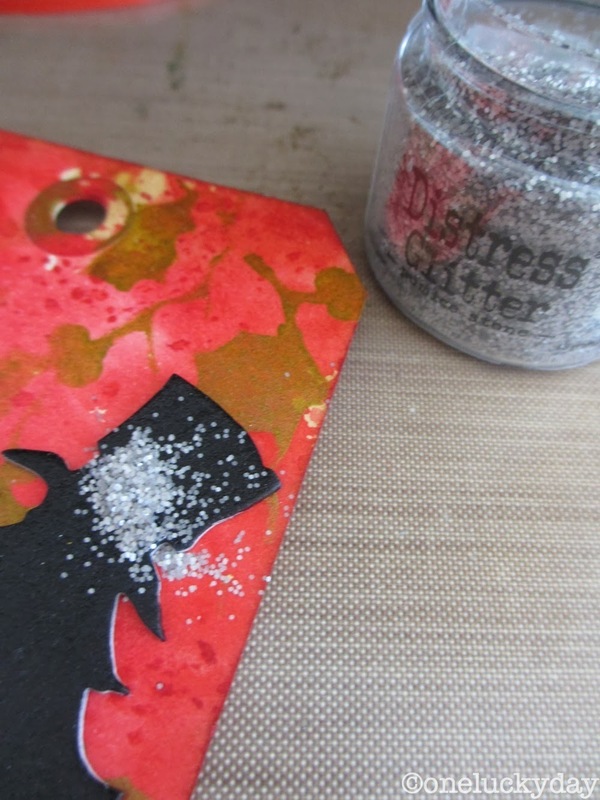 Did you make the mini Christmas Journal from the last CHA using Tim's Christmas book cover with the 25 and rub ons? I'd love to see that inside of that one!!! Happy Thanksgiving! I really love the holly stencil, and how many fun things you've done with it. Happy Thanksgiving! So cute!!! I just got my stencil in the mail and you have inspired me!! Must have the Holly Stencil! Hope we get some CHA sneak peeks. Happy Thanksgiving! OMG. I NEED THIS STENCIL....I NEED THE STAMPS.....I NEED THE DIES!!!!! I WANT IT ALL!!!!! You've been creating fabulous projects with those stencils! This is gorgeous. A modern version of vintage. Love it! This tag is seriously awesome!! This tag is fabulous! Happy Thanksgiving, Paula. I was blessed to have won a Holly Stencil from Richelle's Blog and today I received it in the mail. Yoohoo! Seeing your beautiful Holly stenciled tag made me smile and filled me with inspiration. I can only hope to create something just as lovely. Thank you for sharing your pretty creations!! Have a wonderful Thanksgiving, full of love, good food and many happy new memories! love love love it. great colors and love the silouette die. Gorgeous tag Paula! Love the rub-ons and glitter on the hat, such great details. Very festive! The music remnant rubs look great on the black, love the look and detail. Your really making me want that Deco stamp set and the die! If you find something better than a ladder beside the road this year I'm going on a road trip with you! love the white rubs on the black paint - great tag - thanks for sharing! Very Festive! Love that new stencil and your tag is gorgeous.